Finland's best-selling cookbook is adapted for American kitchens. 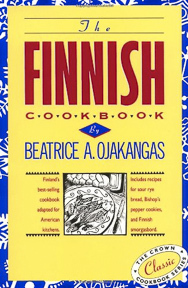 Because bread is the mainstay of the Finnish diet, fourteen different kinds are included in this book. As most vegetables are scarce, Finns show great ingenuity with their recipes here. Fish, a prime ingredient, makes a statement with such dishes as fish in a crust, glass master's herring, and cobbler's salmon. Here, too, are meats, casseroles, and "breakfast cheese," along with fruit soups, which are served as dessert. The book pays particular attention to the delicacies of the coffee table, including recipes for coffee triangles, saffron rings, bishop's pepper cookies, and many cookies and cakes.